Lord Weyland–a scientifically-minded bachelor whose wealth and title (a mere “baronet”) disqualify him from Cat’s consideration–is roped into giving her advice and guidance in her quest for an appropriate spouse. As cash-strapped suitors descend upon Cat’s cousin’s home, Lord Weyland wishes he had any other job. At the same time, Cat begins to wonder whether she really can reconcile her duty to her father and her own new-found desire to love her husband. Does The List really hold the key to her future happiness? 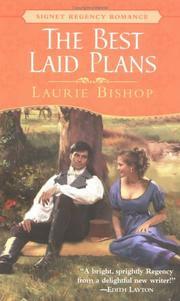 Laurie Bishop’s strongest suit is her snappy dialogue, particularly between her hero and heroine. From their first encounter, Cat and Lord Weyland have a lively and engaging chemistry. Their exchanges crackle, and I found their relationship and the various obstacles to it to be credible. Although there are no explicit scenes, their romance is compelling. At the same time, many of Bishop’s secondary characters–even when they are only lightly sketched in–evoke sympathy and are vivid and believable. I would wish that Cat’s companion and cousin, Rebecca (Becky) Prescott, had been more developed. In many ways, she is as compelling a character as the heroine, and her story–which happens mostly offstage . . . erm, off-page–could be a much better foil to Cat and Weyland’s struggles if it had been showcased. Yet the book does have problems: In one scene, Cat tells a ‘charming’ story (with herself at the center, of course) of a visit to a Virginia cousin. When a small child is menaced by a bull, Cat knows just what to do to save the boy. While the brilliant heroine is drawing away the bull, the “fieldhands” are apparently standing around, flummoxed. For one, it is hardly believable that a shipbuilder’s daughter is better at dealing with angry bulls than any “fieldhand.” Worse, the plantation setting and the date of the book leaves little question about who these fieldhands really are: almost certainly, they are slaves. Bishop’s clumsy avoidance of this detail and her erasure of the slaves’ agency and ingenuity, merely to give Cat a heroic moment, is highly uncomfortable. It would have been wiser to have kept her family firmly rooted in Boston. I also have quibbles with the treatment of women in general in the book: as noted, Becky gets very little development, and when she does, it is mostly to push Cat in the right direction for the purpose of plot development. Close cousins ought to talk more, and to talk about more than men. At the same time, despite Cat’s big dreams and Weyland’s broad interests, the choices that they make at the end of the book are not what I would have expected. Frankly, they are disappointing. It is as if Bishop believes that Cat must give up her defining characteristics to prove her love–even though it would make as much sense or more for Weyland to compromise on his own values. Despite these flaws, The Best Laid Plans is a thoroughly enjoyable, quick read, filled with spunky dialogue, a fair amount of chemistry between the lead characters, and a humorous climax. Although I have quibbles with a number of Bishop’s choices, I do recommend her book and salute her for creating so many interesting characters in such a slim volume.